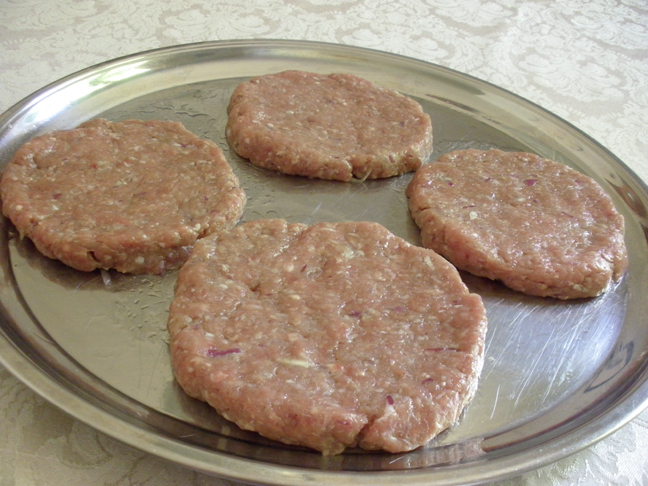 Ground veal or beef, 600 grams. Onion, 1 large, coarsely grated. Salt and black powder pepper to taste. Note: Have some vegetables or corn handy to grill as well, so as to make the most out of your barbecue session. This time, I grilled zucchinis and made mixed quinoa with zucchini for supper. Method: Mix meat, onion, salt, pepper well just as you would for kebab koobideh, except you would not need to knead as much. Form the mix into a big meat bowl and divide it into four smaller ones. Get a large plate and spread oil on its surface evenly. Remove excess oil; this is only to make sure the flattened meat bowls will not stick to the plate. Shape into four hamburger patties. 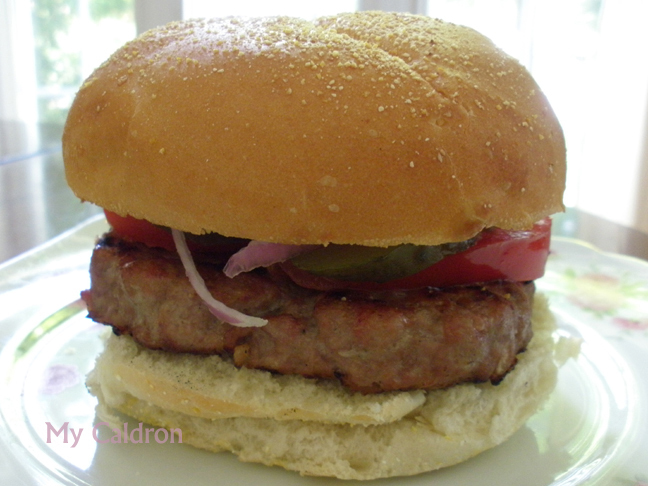 Note: Patties will shrink considerably after being grilled so make them large but not too thin. When your charcoal are read and ready, place a clean grill on the top and allow 5-10 minutes to get it hot. 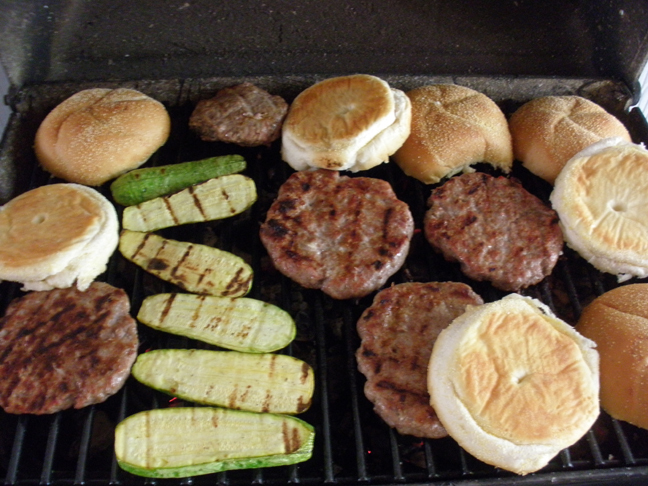 With your hand or a spatula, gently place the patties on the grill over the flames. Cook one side completely before turning to cook the other side. Near the end, warm up your buns too. 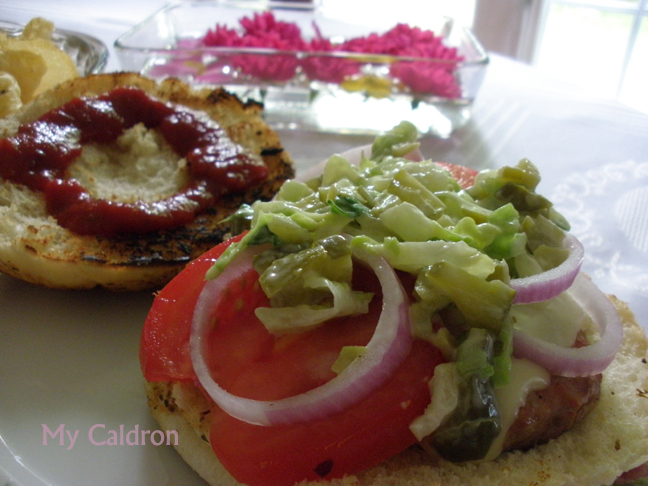 If you like cheese burger, place a cheese slice on top of the cooked patty while still on the grill for a few seconds, then transfer it on the bread, but do not cover until you dress with vegetables of your choice.